Located in the heart of Koreatown, this 12 story Mid-Century building with its vibrant exterior and industrial chic interior set out to capture the 24 hour energy of its neighborhood. The modern rooms feature floor-to-ceiling views and are furnished with chairs upholstered with Mexican blankets, burlap poufs, marble and lacquer tables and other locally made objects. Onsite restaurants include 2 by Cult-favorite chef Roy Choi, POT, a hip-hop fueled take on Korean hot pot, and The Commissary, Choi’s veggie-centric restaurant housed in a stunning glass greenhouse that sits poolside. Morning coffee is best taken in the lobby at CaFe where you can peruse an expertly curated collection of locally designed jewelry, bags and home design pieces in the boutique, Poketo. At night, the only place to be is the uber-hip Break Room 86, an 80s themed bar with private karaoke rooms, arcade games, DJs and live music alongside throwback cocktails. 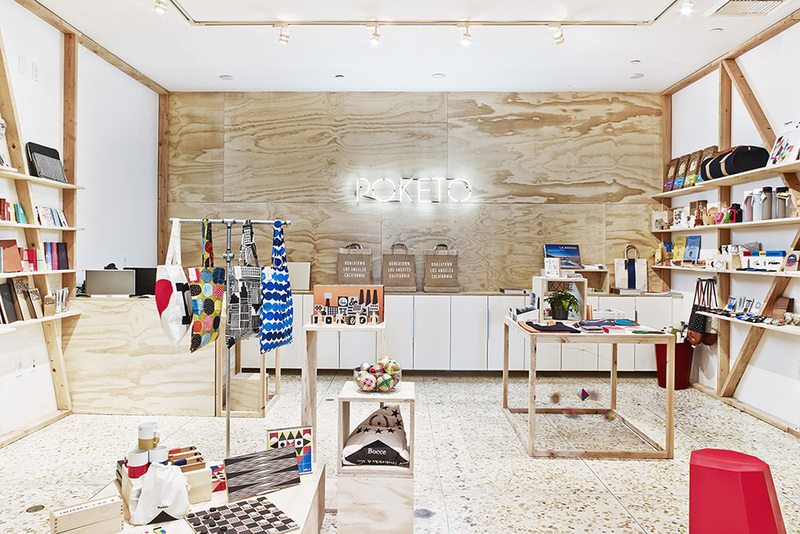 If you are getting the vibe that this is a clubhouse for Ktown's burgeoning hip kid scene, then you're on the right track. 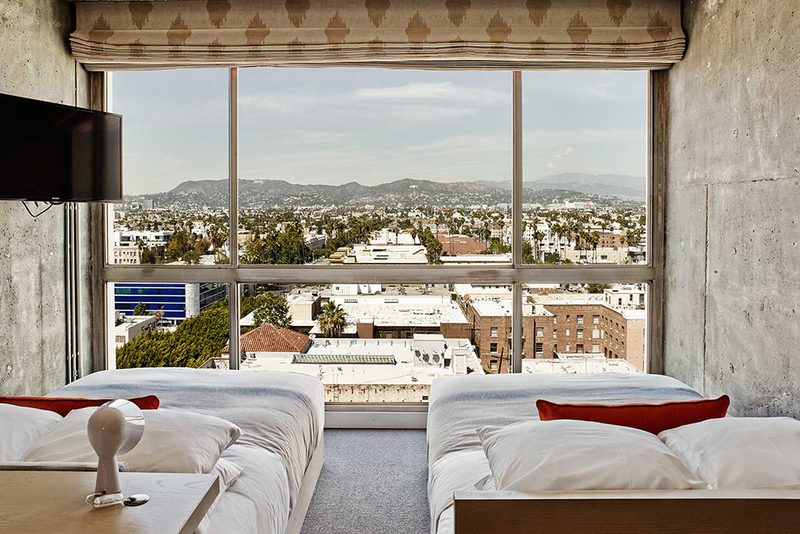 Ask for one of the rooms facing Hollywood and wake up to floor-to-ceiling views of the famous Hollywood Hills. Free yoga on Saturdays for guests! Get your caffeine fix in the lobby CaFe with a globe-trotting array of baked goods (mochi cakes, lucha leche, custard buns, Hawaiian pull-apart bread). On the corner of Wilshire Boulevard and Normandie Avenue in the heart of Koreatown, within walking distance of an impressive array of restaurants, bars and clubs. A Metro station is close by. Room rates start at $209/night. Noise can be louder in the roadside rooms as well as the ones near the nightclub. Children under 18yrs old can stay for free when using existing bedding. When in Koreatown, the obvious choice is Kprean BBQ. Kang Hodong Baekjeong is a local staple and Dan Sung Sa is a loveable dive — you can’t go wrong with an order of chicken skewers and a tall glass of soju. Beer Belly is a local gastropub with a strong beer list, and Brass Monkey is a bustling karaoke bar that draws crowds from all over the city. The LINE Hotel is also half a block from the Wilshire Normandie Metro stop, making it easy to explore the city’s public transit system. Just a few stops East and you’re in the heart of Downtown where you can gallery hop on Main Street, feast on papusas at Grand Central Market, or dance the night away at Honeycut.